During an event on Saturday, Oct. 14, Sarasota County, in partnership with the South Venice Civic Association Water Quality Task Force and the Southwest Florida Water Management District, will mark the completion of the South Venice Beach Waterway Restoration Project, the county has announced. The celebration will take place from 10 a.m. to noon at The Grove at the Siesta Waterway, which is located at the corner of Quincy Road and West Seminole Drive in South Venice Beach, a county news release says. The event, which will include guest speakers, informational booths, refreshments and opportunities to tour the project sites, is free and open to the public, the release points out. 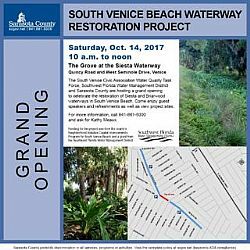 “The celebration will be a culmination of the work to restore and rehabilitate approximately 7,500 linear feet of the Siesta and Briarwood waterway banks in South Venice Beach,” the release explains. “By helping promote a healthier drainage system, the project will make both waterways more habitable for fish and wildlife, and improve the quality of the water entering Alligator Creek and Lemon Bay,” the release notes. Reduced mowing and maintenance costs, stabilized banks and biological conditions that will continue to improve over time are among other project benefits, the release adds. A $300,000 grant from the Southwest Florida Water Management District, along with $313,000 from the county’s Neighborhood Initiative Capital Improvements Program for South Venice Beach, funded the project, the release says. “South Venice Beach, which is one of the largest neighborhoods in Sarasota County, has approximately 8,000 homes, more than 14,000 residents, more than 20 lakes and ponds, 150 miles of swales, 100 miles of roads, 39 parks and 1,400 feet of Gulf of Mexico frontage reachable by community ferry,” the release points out. For more information, call the county Contact Center at (941) 861-5000 or visit www.scgov.net.